2mm North East Area Group: From the 'wish you were here' brigade....! From the 'wish you were here' brigade....! With very little recent activity here greetings with a very short posting live from Spalding Model Railway Exhibition which shows what I've been up to. The pictures on the left show roughly half of the hall in which we were situated. 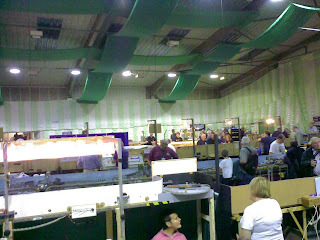 There was another equally large hall too. Astute observers will spy Yvonne sitting beneath the fiddle yard chatting to another railway lady on the layout next to us. (lower picture) Although not what could be called a fine scale show there are one or two gems here. 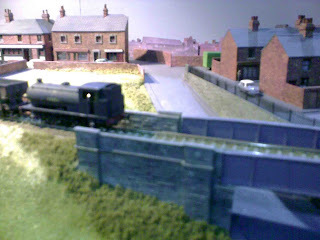 The model shot is a rather poor one taken too close to the subject using my mobile phone but shows the J94 hauling a train of empty FMF 21 ton coal hoppers just about to cross the new road bridge on the recently introduced extension. I'll update the blog with some decent shots of the extension on our return North.